Purchasing glasses have always been a chore as they break quite easily. My son alone has gone through 3 pairs of glasses within the last year due to the arms breaking! I contacted EyeBuyDirect.com and asked if I could possibly review a pair of glasses. They generously agreed and mentioned that you should NOT order children's glasses by the Internet as they are not old enough to know when there are problems with the glasses which could in turn damage precious eyes. I ordered a pair for my older son and thought that I could take them into the Eye Doctor to make sure there were no issues. We received the glasses this weekend and they are perfect! The frames are very sturdy and thicker than the frames we've been purchasing and he can see much more clearer than the other glasses he had (Which happened to have broke, by the way). Let's not forget stylish! With self esteem issues, it's always a pleasure to find something that you feel comfortable in and look good. At EyeBuyDirect.com there are SEVERAL styles to choose from for both men and women at very affordable discount prices without the sacrifice of quality. Needless to say, we are quite happy with our selection! I have also posted a picture of the glasses for you to view. 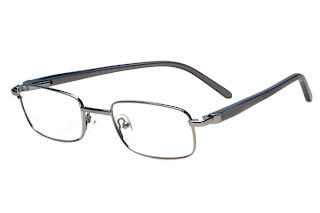 I ordered this set of glasses, Bridge in the color Grey which included a protective case and cleaning cloth. (Picture below) for $39.95 plus shipping. How easy is it to select your perfect pair of glasses? First, I highly recommend using the Eye try feature and post it on the 'Wall of Frames'! Simply upload a picture of yourself and use the photo to "try on" the glasses until you find the best pair that suits your features and style preference. Once you have chosen your style of frames, you'll then click on "Select lenses" and type in your information from the eye doctor. There are also several "extras" that you could choose from and still pay less than you would pay in the stores. How much did my order come to? $58.95 with shipping! Once the glasses were ready, they were shipped and arrived within 2 days. **Order and shipping times may vary. You could purchase your new glasses at EyeBuyDirect.com Use code #IFE7PFWJGU at checkout, you will receive 10% off of your purchase. Only open to USA entrants at this time. To enter this giveaway you MUST Post your "Eye Try" photo with your favorite frame on the 'Wall of Frames'and then come back here and comment with your link. This is MANDATORY REQUIREMENT PER THE SPONSOR! If you do not complete this requirement you will be DISQUALIFIED! BONUS ENTRIES: These are optional and not required. However, it will give you more chances to win. Please list each entry in a separate comment or they will only count as one. This giveaway will end on 7/25/09 at 11:59pm CST, I will email the winner and you will have 48 hours to reply to my email with your shipping information or I will choose a new winner. Disclaimer: I have not and will not be paid for this review. The sponsor generously let me try a product from the company and I have only posted my own personal opinion to share with other readers. I hold no responsibility between you and the sponsor, and/or products you may purchase or receive from them. Luv to win. Many thx. Great prize! I have to change glasses once every year, so this will come in handy. My hubby just mistook me for a potted plant! He could definitely use some new specs. I posted my pic. I love this site and I need some new glasses. I think I will be on there all day deciding what to order. that was fun! sorry the pic is super silly of me!! and it too ke me forever to figure it out! i posted a comment on the wall of frame (its under my own photo!! Ok here's mine! Thnaks for the great giveaway! My favorite so far is the Okanagan. Here's me modeling them. Hahah! I think I'd pick the Donna. I like the Metal Eyeglasses - Apache - Gunmetal. Please accept my entry. Thank you. I would pick the Bueno - Wine glasses! I really like: Merlin - Green - Rimless Eyeglasses. If I won I would choose the Cat. However, the Basil are very nice as well. So many great glasses to choose from! I am a follower. Thanks! I left a comment under Reann's Picture. The Eye Try was really cool. What a great way to try on glasses. I like the race style. Thank you.